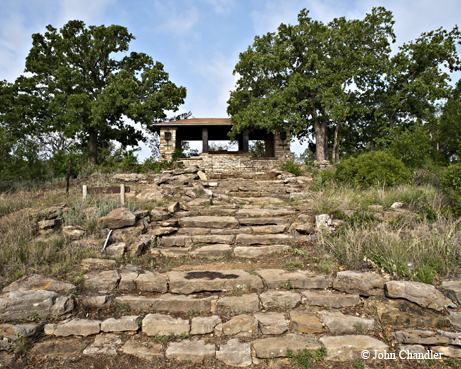 ﻿﻿﻿﻿﻿﻿﻿CCC features give Lake Brownwood State Park a nature-designed feel. There’s a serene peninsula on Lake Brownwood that offers more than stunning sunsets. 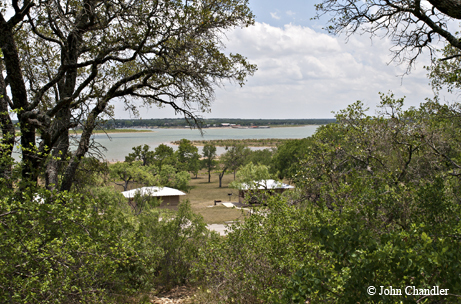 Lake Brownwood State Park is one of the most extensively developed Civilian Conservation Corps (CCC) parks in Texas. A part of Franklin D. Roosevelt’s New Deal recovery program for a country in the depths of the Great Depression, the CCC enlisted unemployed young men to improve undeveloped land across the country; the work gave hope and income to the enrollees and their families. The Civil Works Administration (CWA), the forerunner of the CCC, started work on the park in 1933. CWA workers completed the park’s centerpiece, a beautiful refectory built from native stone. CCC Company 872 worked in the park from November 1934 to October 1935, and CCC Company 849 arrived in October 1936 and stayed until the park was completed in February 1942. Those workers built the entry portal to the park, picnic sites, Fisherman’s Lodge, a grand stairway to a boat dock, two park residences and 16 stone-and-timber cabins. All of these rustic facilities were designed with nature in mind, and built with local materials. The park’s name has changed over the years; it started as Brownwood State Park in 1933, became Lake Brownwood State Park in 1935 and in 1946 was renamed the Thirty-Sixth Division State Park to honor the Texas Army National Guard unit that mobilized from nearby Camp Bowie. The name changed back to Lake Brownwood State Park in the 1950s. Far from being a historic museum, the park encourages visitors to enjoy the CCC’s handiwork today. Stay overnight in a cozy cabin, hike the trails past picnic sites that appear to grow out of the landscape, or walk down to the water’s edge on the boat dock stairway and appreciate the craftsmanship of this grand feature. Campers can choose from lakeside tent-only campsites, sites with water and electricity and sites with full hook-ups. The park’s trails are ideal for hikers and bikers of all ages and abilities. The new Nopales Ridge Trail is already a favorite for mountain bikers — it winds and climbs through a limestone ridge and past shaded woodlands. Wildlife watchers will love the Texas Oak Trail that dips down to the water’s edge on the north shore of the park. Hikers who take Opossum Loop may catch a glimpse of wild turkeys, white-tailed deer or the trail’s namesake from the wildlife viewing blind on the trail. Lake Brownwood has been below capacity, but visitors can still enjoy swimming, boating, fishing or skiing on the lake. Lake Brownwood State Park is located northwest of Brownwood. Take Texas Highway 279 northwest for 16 miles, and then head east on Park Road 15 for six miles. For more information, visit tpwd.texas.gov/lakebrownwood or call (325) 784-5223.